Last week we talked about October being Domestic Violence Awareness Month, but as you know, it is also Breast Cancer Awareness Month. To refresh your memory, we're giving you a few important facts about breast cancer, and encouraging you to show your support and solidarity in finding a cure. Share these facts with those you love, and always make annual (at minimum) appointments with your doctor a priority. Knowing and acting is the healthiest thing you can do. No fear! 1. Breast cancer is a disease in which malignant (cancer) cells form in the tissues of the breast. It affects millions of women, and thankfully gets the needed attention to fight its surge. 2. Regular doctor visits and mammograms for women over the age of 40 are critical in breast health. If you are at risk for breast cancer, because of a history of the condition in your family, you should have mammograms sooner for early detection. Many insurance companies have improved coverage for breast health, and social service centers are helping out as well. Check our local area for more. 3. Each year it is estimated that nearly 200,000 women will be diagnosed with breast cancer and more than 40,000 will die. We must get these numbers lower. 4. Breast cancer impacts us all. Approximately 1,700 men ill also be diagnosed with breast cancer and 450 will die each year. This isn't just about the ladies, gents. We hope we're inspiring you to show your awareness (backed by action) all month long. 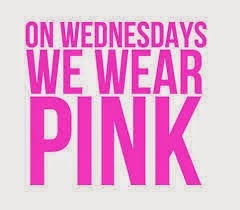 Like the last couple years, we're wearing pink on Wednesdays to show support for breast cancer awareness. To recognize domestic violence awareness, we're wearing purple on Thursdays! Fashion for a cause--It's the B.A.F.F.L.E.D. way! Share your pics on Twitter, Instagram, Pinterest, and Facebook with these hashtags! 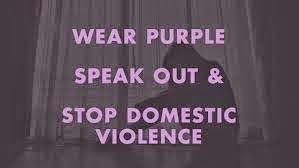 *Don't forget about October being Domestic Violence Awareness Month, too! Join is as we raise awareness this month, and always. Awareness and action don't end when the month does. Thank you for this post! Women need to stay informed.